When Yukari Morita decided to look for her missing father who disappeared in the South Seas, she had no idea how far her journey would take her. Just traveling to the Solomon Islands is a long way for a high school girl to go on her own, but then Yukari runs into an astronaut from the Solomon Space Association, which has been trying to build a rocket powerful enough launch a man into space. Upon meeting the petite Yukari, however, SSA director Nasuda realizes that she's small enough to go up in a less powerful rocket the SSA has already built! So he offers her a deal: if Yukari agrees to become their astronaut, the SSA will help find her missing father! Will Yukari have the right stuff to blast off in the wildest space quest ever? Rocket Girls adapts the first two volumes of Housuke Nojiri's light novels of the same name with some differences between the animation and the original work. The series was produced in cooperation with the Japan Aerospace Exploration Agency. It first aired on Thursdays on the WOWOW satellite network before moving to a new timeslot on Fridays. What were your first thoughts when you heard about the title name? Well, my first thought was &quot;this is lame title for a series, so I\'m guessing its gonna be a pretty lame series.&quot; Well... I can tell you, I was wrong, really wrong and I don\'t regret being wrong because it\'s one of the best random title\'s I\'ve ever picked up. The story focuses on the adventures of 3 main characters, Yukari Morita, Matsuri and Akane Miura who comes in later in the series. Although, their dreams of becoming astronauts wasn\'t intentional, it just sort of happen when Yukari wanted to find some answers in the disappearance of his father and why he left her mother so suddenly on their honeymoon trip. On another note, there was this Space Agency in crisis where they needed someone drastic at a respectable size to continue their space program expedition before they lose funds and thats where Yukari comes in, in willing to help out for the exchange from them helping her look for her father. In addition, this is where the comedy comes it. While it\'s strange for a couple of high school girls to be able to become astronauts in a short period of time, it does gives a sense of idea where anything is possible if you set your mind to it. The training, the laughs, making friends, trusting each other are all memorable moments a person experience and this series stay true to that. The character development is acceptable as they start to become less naive about the dangers they face but the adventures is what really lacked the most. Not enough mission I will say as a majority of the episodes were focused on the training. If it was a 24 or 26 episode series, then I wouldn\'t have picked on that but that wasn\'t the case. The OP &amp; ED was good considering it fitted well on the series as a whole. I believe the purpose of the OP was to lift your spirits high and prepare for new challenges to come and I reckon it delivered that. Inconclusion, a well worth series to watch. There are some humor moments where it gets you through those dull moments but the adventures and experiences from these 3 girls is what gives you the enjoyment of the series. Add two points to the score if you're a girl between 10 and 13. The first half of this is series is pretty enjoyable; after episode five I'd have given it at least a 8. The story is far fetched but the characters are fun and the writing is crisp but after that the story goes from far fetched to ridiculous to absurd. Major characters vanish from sight, others are introduced but add nothing and the lead character turns into just another plucky girl adventurer. It's rare to see a series self destruct as quickly as this. Rocket Girls is to science fiction as Scooby Doo is to ghost stories. Rocket Girls is an exciting departure from the sci-fi depictions of space which many other series tend to favor. The plot of Rocket Girls is fairly straight-forward. The Solomon Space Agency finds itself incapable of building a rocket which can transport an adult male into space. What they can build is a smaller tried-and-tested rocket which can get a high school girl into space. After some convincing, our main protagonist Morita Yukari joins the SSA as the first high schooler to become an astronaut. The series examines some of the foundational principles of space flight in a very entertaining manner. For instance, Morita becomes rather concerned when she learns that a new fuel type is being developed for use in the rocket and tends to blow it up rather than push it into space. Throughout the entirety of the story spaceflight mechanics are closely adhered to. So closely, in fact, that at one point during one of Morita's lectures on orbital mechanics the board is shown with a number of actual equations regarding the Hohmann Transfer maneuver. There are numerous such instances of 'Did the Research.' The suits used are well understood concepts known to the professional world as Space Activity Suits. The capsule used has a Delta V capacity befitting something of its shape and size. The lifter has an appropriate size and payload capacity. The colors and atmosphere of the series are very warm, resulting in a fun show about schoolgirls in space. There are a number of CG elements in the series which are smoothly blended into the animation which add a futuristic, clean touch to the spacecraft shown. The three main characters are introduced over the course of the first half of the series and, while they don't break ground in character exploration/depth, have believable personalities and mix well with one another. Morita Yukari is energetic and stubborn. She's argumentative but can be persuaded with some effort. Matsuri, Morita's half-sister, is entirely technologically illiterate at the beginning of the series. She makes up for her lack of knowledge with a cheerful personality and solid moral character. Miura Akane is the resident geek whose emphasis is biology. She's quiet, incapable of strenuous physical labor, and very determined. As someone who is well-versed in the mechanics of spaceflight at the formal level I was flabbergasted by the attention to detail which this series possesses. As such, I had an amazing time watching the show and could not help but grin every time a physical principle was accurately referenced. It bears mentioning that this series was made in conjunction with JAXA (The Japanese NASA), and it shows. Even ignoring the technical sophistication of the show, the story and character development is something which I enjoyed thoroughly. It was fun, interesting, and constantly entertaining from the beginning of the first episode to the credits of the last. Put all the previously mentioned items together and one gets a meticulously accurate, highly entertaining show worthy of consideration even by those whose interests do not include spaceflight. I've tried writing a review for this at least 4 times now and I just can't gather my words to make sense. 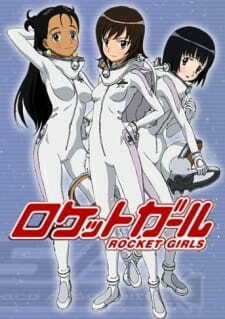 I picked up Rocket Girls expecting a cute slice of life about cuties who do things with rockets..... What I ended up watching was an amazing and incredible anime about becoming astronauts. and everything happens really quickly. Honestly, I don't know how to write the story down in a way that makes sense without it being a straight up dissection of Rocket Girls. It's best if I just say that Rocket Girls isn't what you'll expect it to be, it's full of great twists and many heartfelt moments. I teared up a lot as the anime was reaching it's end and then the last episode happens and I almost cried. It's a cute story, but it's not a slice of life, in-fact I'd go as far as taking Rocket Girls seriously for when the serious moments happen, because it's very tense and has drama that will make you want to watch the entire show in one sitting. Art style, Rocket Girls is one of the most beautiful anime I have ever seen. Bright, vibrant and absolutely radiant colors explode off the screen, it's such a visual treat. The animation I feel is really really good too, though I found the CG scenes to be pretty poor for the most part. Sound/Music: Off the walls great music. I need to find an OST or something because everything that was played was just fantastic. Every single song and sound that we hear in Rocket Girls is top notch, presented well and played beautifully. Everything makes sense and there are clear reasons for what is being played and why. ....... I really don't know why this one is giving me a hard time to write things down for, I guess I just feel really impacted and can't write anything good down at all. I guess I'll just say that Rocket Girls is a really good show that does a great job of mixing comedy (I laughed out loud so many times), drama/tension, heartfelt moments and cuties. Come for the girls, stay for the story and characters. The girls are really really cute too, especially their astronaut outfits, love love love it!! !